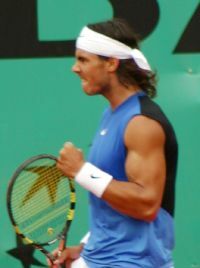 cosmix.org | Rafael Nadal wins Roland Garros. Again. Rafael Nadal wins Roland Garros. Again. This is one of tennis’ paradoxes and it makes the Grand Slams this year, and I guess probably for some years to come, so much more interesting. Roger Federer (pictured left) is one of the best and most promising male tennis players in the world, and some argue one of the greatest, if not the greatest, male tennis player of all time. He easily beats most leading players with no sweat — as his impeccable record has shown, but when it comes to Rafael Nadal and clay he struggles and, more often than not, loses. Take for example his win-loss record for this year: 44-4 having lost all 4 games to Nadal. Federer has a single weakness: clay, and that’s where Nadal dominates. Since he lost Roland Garros in 2005 (he was defeated by Nadal in the semifinals) improving on clay must have become his main training goal. Yet despite his efforts, 20 year old Spaniard, Rafael Nadal, just won the French Open (Roland Garros) earlier today, his second time, after beating Roger Federer in a rare game, under intense heat (32ºC). Federer’s performance against Nadal makes the game so much more interesting for the fans: he made some ingenious counterattacks, and he was playing defensively — quite rare for Federer — and Nadal fought on and won the final, with 1-6 6-1 6-4 7-6 (7-4) and a win-loss record of 14-0, taking his total winning streak on clay to 60 consecutive matches, the longest record in the Open Era. Needless to say, irrespective of Federer’s prowess and all around supremacy in the sport these days, Nadal is a rare, formidable player. His record to date has more or less granted him a place among the greats and I gather his playing can only improve in the future; I guess his performance today should lessen the number of critics that refuse to accept his value. He’s only 20 years old after all. Well done Rafael! Interesting times await us. Nadal picture from Flickr, licensed under Creative Commons. cosmix.org | On Roland Garros and Federer's nightmares.